Two beings not quite of this Earth, Tilda Swinton and Benedict Cumberbatch unleashed their Jenga skills on the world this afternoon. As opposed to simply doing a boring old Q&A on Facebook Live about their new movie Doctor Strange, they demonstrated marvelous (get it?) dexterity while responding to queries written on the bricks. Though it’s typically a nerve-wracking game, watching these two participate is a rather soothing endeavor. Mind you, Swinton announced at the outset that she had never played Jenga before, which makes complete sense. Why would she bother with activities meant for children and drunk people at hipster bars? As the tower grew more unstable they kept up a lovely banter. 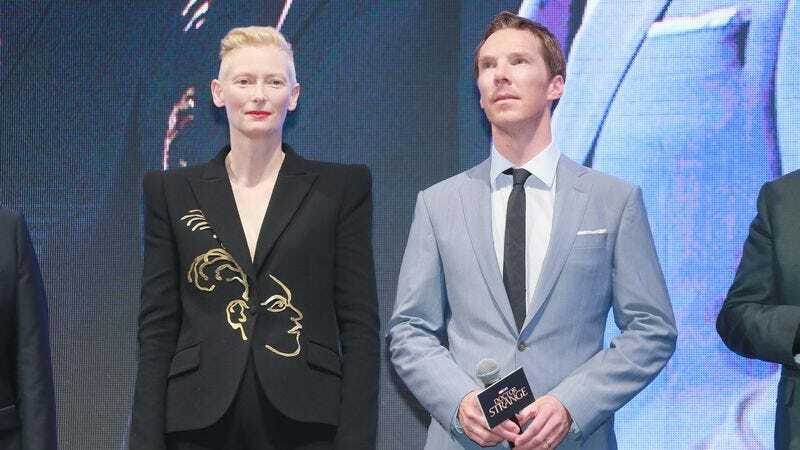 Swinton asked Cumberbatch if he has any nicknames, after she went through her own. (Tilly, Swin, and the “fictional” Swilda, if you’re wondering.) “I mean,” he said, noting the obvious, “with a name like mine—it’s heaven.” He had oodles of praise for her, saying he learned he “would really like to be a woman in order to wear what she wears.” She countered: “But you can.” Though she’s right that gender is no obstacle to what one chooses to wear, it is impossible to dress like Tilda Swinton if you are not Tilda Swinton.